InterTrader Review & Complaints 2019 - Safe or Scam? Demo? App? Fees? 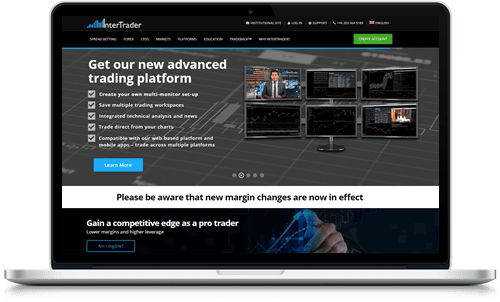 InterTrader is a British financial firm and a great option for anyone looking to trade CFDs and forex or partake in spread betting on some of the world’s most lucrative instruments. The broker is owned by GVC Holdings PLC which is one of the largest sports betting and gaming groups in the United Kingdom. InterTrader has two operative licenses from the Financial Conduct Authority (FCA) in the UK and Gibraltar Financial Services Commission (GFSC) in Gibraltar, who oversees and regulates every part of the broker. Would you like to know more about InterTrader? Then continue on with our comprehensive broker review. Trading with InterTrader is a cool experience, they offer a ton of assets, a top modern trading platform, and a great (and free) demo account. While we feel that there any many brokers who offer better alternatives, InterTrader is still a good option for anyone looking to trade. As mentioned, InterTrader is owned by GVC Holdings which is a highly reputable gaming company based in the UK. GVC is listed on the London Stock Exchange and is very serious in every part of their business. Also, InterTrader has two licenses from two very strict agencies that ensure that every part of the broker is operated in a safe, fair, and correct way. Because of these two reasons alone, we are convinced that InterTrader is not a scam and that it’s a reliable company that you can trust with your information and more importantly with your money. And in case anything questionable would happen you can always rely on the FCA to support you. We really like the setup InterTrader has chosen for their trading platforms – there is a solution for everybody here, and it’s not too complicated to understand. First and foremost, InterTrader offers the MetaTrader 4 forex trading platform which is the best option for traders looking to only trade currencies. InterTrader also offers the ZuluTrade platform which is a copy trading platform that you can use to copy other successful traders and avoid the analytic work. In addition, InterTrader has also designed their own trading platforms that we believe are some of the best out there. The Web Platform is a “No Dealing Desk” platform that you can access directly through your browser. It has been designed with CFD trading and simplicity in mind. Then there is the Advanced Platform which is a downloadable platform that rivals some of the leading software on the market. The advanced platform is compatible with both Windows and Mac OS, and it allows you to execute quick trades in a professional matter. Obviously, all of the above-mentioned platforms also come with state of the art charting tools and analytic capabilities to help you perform at your best. In order to stay relevant in the industry, InterTrader has developed a pro-class mobile trading app that can be downloaded to Android and Apple devices, i.e. tablets, smartphones, iPhones, and iPads. The InterTrader mobile platform allows you to open and close positions freely while on the go and it is the perfect tool for the busy trader that needs around the clock access to the platform. InterTrader’s selection of assets is both satisfying and quite unique. Besides offering individual shares and indices from Europe and the United States, commodities, and currencies, InterTrader also provides CFDs and spread betting on bonds, interest rates, and an asset class they call “Specials.” The Special class includes CFDs and spread betting on US Nonfarm Payrolls, grey market IPO prices, etc. As you can see, the selection is extremely varied with several unique opportunities, and it provides some really fun possibilities. Before you register a trading account with InterTrader, you need to decide which platform you want to use. Spread betting and CFD trading can be done on both the MetaTrader 4 and InterTrader’s own platforms, but you can’t have one account for both platforms. The accounts are pretty much the same with really tight spreads, great margins, and tools that you need to trade. However, the MT4 does not support stock trading, and InterTrader’s platform doesn’t come with MetaQuotes Expert Advisor. After you’ve decided on the platform you want to use, you sign up and verify your identity which is very easy. Better yet, InterTrader is very fast with the verification process, and you can be trading in as little as five minutes. If you want to familiarize yourself with either one of the platforms offered by InterTrader, we suggest you open a demo account. So, if you’re planning to use the MT4 you open an MT4 demo account, and if you want to use the broker’s platform you open an InterTrader demo account. When you open the InterTrader demo account, you also gain access to the mobile trading platform which means you can test drive the trading app as well. Demo accounts have many benefits which you can read more about by following this demo account link, and we always encourage our clients to open one. You have three options to choose between for your deposits and withdrawals. You can either transfer money from your bank account to InterTrader’s bank account just like you would to any other person or business. However, it’s more popular to use a debit or credit card since it is easier and usually faster. The third option is to use the online payment service Skrill to quickly transfer money from your Skrill account to the broker. Withdrawals can be done using the exact same payment methods, and InterTrader wants you to withdraw money to the same account that the initial deposit was made from. Over the past few years, InterTrade has been awarded for their excellent customer support, and we can’t do anything but agree. We have been in contact with InterTrader over chat and phone and are very pleased with the treatment and help we received. Live Chat – The easiest way to quickly get in contact with InterTrader is via their live chat located on their website. Address – You also have the option of visiting the broker’s headquarters in London at London EC4M 9AF. Trading with InterTrader is both fun and exciting. Their wide selection of assets, modern trading platforms, practical demo accounts, and excellent support team all play a part in creating one of the best forex and CFD brokers out there. An added bonus is that InterTrader supports spread betting which is a fun way to diversify your portfolio. And remember, spread betting is tax-free for everyone residing in the United Kingdom, so you get to keep all your profits.